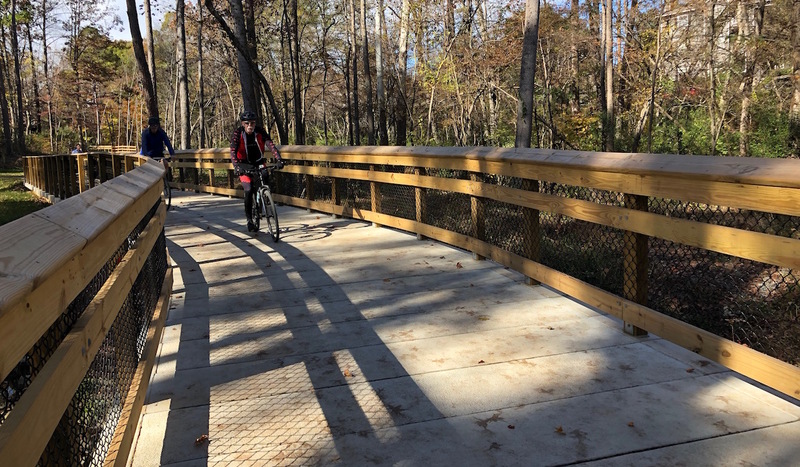 The Campbell Creek Greenway is the latest connection to Mecklenburg County’s McAlpine Park Greenway network, increasing the overall trail length to just over five miles. The designed path called for six boardwalk structures, some of which crossed several utility lines and small streams, complicating foundation placement. The site was also narrow in some areas with 100-foot protection barriers, and minimizing impact to the area was of utmost importance. Four of the boardwalk structures were to be aligned on either side of two truss bridges, further complicating the design. Because of the site’s complex design features and the area’s popularity, the County wanted to find a durable boardwalk option that could withstand high foot traffic on the trail and minimize maintenance needs. McKim & Creed specified timber boardwalks with PermaTrak’s concrete boardwalk system as an alternate. Following the bid results, Mecklenburg County chose PermaTrak over timber as the cost-competitive and maintenance-free option. Compared directly to timber, lack of required maintenance on the six structures will save the county tens of thousands in maintenance costs. McKim & Creed’s engineering team worked with PermaTrak to design two standalone boardwalks and four short-run boardwalks, set on either side of the two truss bridges. As a turn-key project, PermaTrak took on construction management as well as design. Good soil conditions at the site allowed for fewer footings than the original timber boardwalk design, allowing the foundations supporting PermaTrak’s boardwalks to avoid the utility lines and streams. Avoiding the obstacles with the boardwalk foundations saved the county on installation costs. Contractor: Eaglewood, Inc.; Crisp & Crisp, Inc. Boardwalk Length(s): 18 ft., 30 ft., 72 ft., 88 ft., 92 ft., and 136 ft.
Tread Width(s): 11 ft. 3 in.